Through the community-based, statewide program, for every home Camden National Bank finances, $100 is donated to a homeless shelter in the community of the new homeowner, and in the homeowner’s name. In 2015, Camden National Bank financed 442 new home purchases and raised $44,200 for Maine’s homeless shelters. Dufour added, "With a year under our belts, we can now report that response has been great. In addition to donations of over $44,000 to Maine's shelters, Hope@Home is also helping to increase awareness in our communities. Whether it is someone stopping me on the street to thank us, a new homebuyer sending a note to one of our lenders complimenting the program, or our employees donating their own time to area shelters, we have seen an increase in engagement to help the homeless. Our 'Hope Kits' are another way we can provide support and raise awareness for those in need in our state." 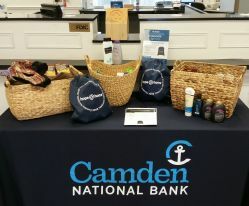 To donate items for Camden National Bank’s “Hope Kit” collection effort, visit your local banking center, or go to CamdenNational.com to find a location near you. For more information on Hope@Home or how to join Camden National Bank’s efforts to help Maine’s homeless individuals, children and families, please visit our Hope@Home page . Photo caption: Hope Kit collections in Camden National Bank’s Newport (top) and Richmond (bottom) banking centers. All bank locations will be accepting donations through the month of February.